"Cook up a pan of Italian sausages and layer them in hoagie rolls with hot peppers, onions, and cheese for a hearty and satisfying meal." Bring a large pot of water to a boil; add sausages and cook until no longer pink inside, 10 to 12 minutes. Drain and set aside. Place marinara sauce in a small saucepan over medium-low heat; cook until warmed through, about 5 minutes. Reduce heat to low and keep warm until sandwiches are ready. Heat olive oil in a large skillet over medium-high heat; cook and stir onion, red bell pepper, jalapeno pepper, and goat horn pepper in the hot oil until onion softens and begins to turn golden, 7 to 8 minutes. Remove onion mixture to a plate and set aside. Place sausages in the hot skillet and cook, turning frequently, until warmed through and browned all over, about 10 minutes. Spread each hoagie bun with 1/4 cup mascarpone cheese and 1 tablespoon garlic basil spread. Place two sausages on top and spoon over the onion mixture. Sprinkle with 2 tablespoons Parmesan cheese. Transfer the marinara sauce to small bowls for dipping. 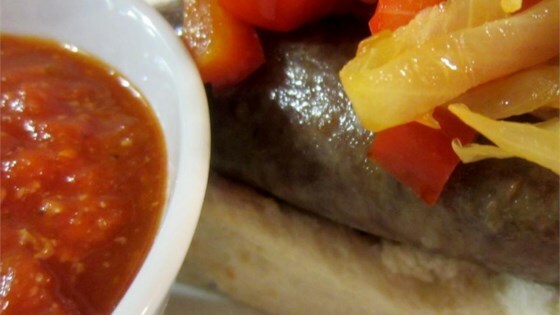 See how to make a classic Italian sausage grinder. Here's the recipe for Garlic Basil Spread. This was way better than I expected. Absolutely amazing. Made it exactly as posted.